How Did We Learn To Do Pottery? Our first contact with clay was a class taught by Bob Fazio. Bob is head of the Art Department at Baylor School in Chattanooga, TN. He was a student of Charles Counts a world renowned potter and author. Our latest clay adventure was at John C. Campbell Folk School in Brasstown, NC. The week long Raku class was conducted by Steven Forbe-deSoule. Steven holds a Master of Visual Arts Degree from Georgia State University. 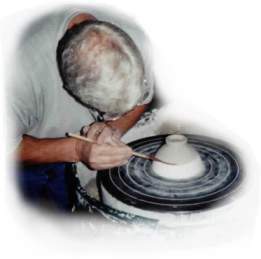 He has taught at Agnes Scott College, Callanwold Fine Arts enter and Odyssey Center for Ceramic Arts. Steven has taught workshops throughout the United States, Canada and Mexico. We hope to add a new decorative Raku fired line of pottery in the near future.